If you are a member of National OLOC who wants to be on OLOC’s National Yahoo email discussion list, you can subscribe by going to groups.yahoo.com/group/NationalOLOC/. Any members of National OLOC with access to the internet can join the group. Messages posted there will show up immediately, so they get to members sooner than the newsletters and e-blasts do. You can get messages delivered to your inbox or by going into the Yahoo website and logging in to retrieve them.The traffic is very light, so you will not get many messages. 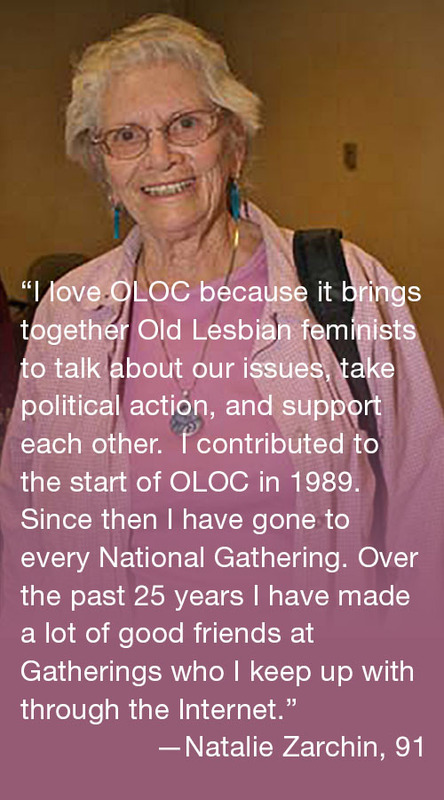 It is a benefit of your OLOC membership that we hope you will use and like if you are seeking emotional support, want to discuss politics, would like to talk about a book you have read, or have a conversation about any issues of interest to Old Lesbians and the oppression/isms that OLOC is committed to fighting against. If you have any problems, contact susan@oloc.org. To find OLOC on Facebook, go to facebook.com/NationalOLOC. See what OLOC members are doing around the globe, from protests to parties! 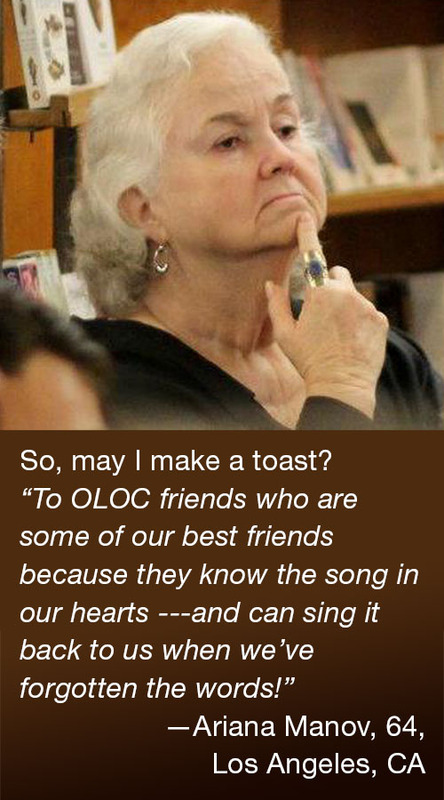 Join OLOC and find your home and your sisters. Work with us, dance with us, march with us. Find out the latest happenings, about the upcoming Gatherings, and what you can do to resist. Don’t miss out! 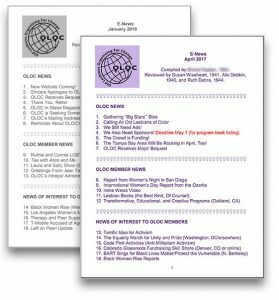 OLOC publishes a monthly E-News around the middle of each month. It is chock full of news about OLOC (such as Steering Committee meeting reports, involvement opportunities, and other organizational happenings), members (such as books published, awards received, and chapter goings-on), and events and activities of interest to members and supporters, including concerts, festivals, book readings, films, political developments (electoral and other), social activities, marches and demonstrations, calls for book and journal contributions, news of specific interest to Old Lesbians of Color, grant opportunities for artists and others, plays, support groups, comedy shows, study results, local and national news, and much more! 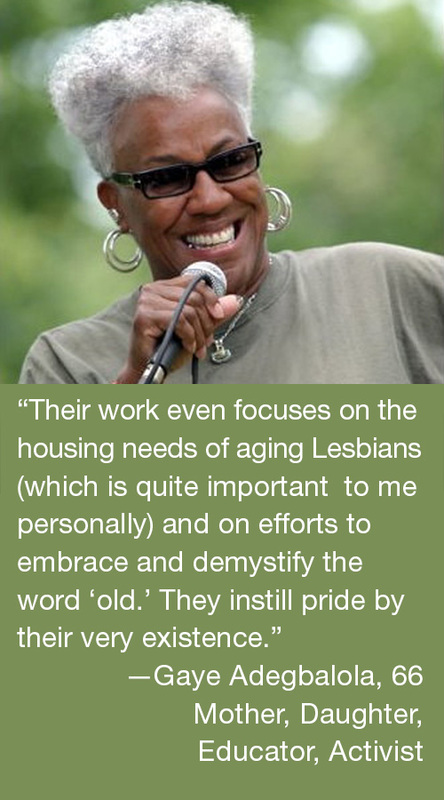 If you have something of specific interest to Old Lesbians to share with our readers, please send it to info@oloc.org by the first week of the month (sooner if possible) for that month’s issue and clearly mark the email subject heading “OLOC E-News.” Include your name (or indicate if you want to be anonymous) and birth year. We may edit for length or clarity, and we reserve the right to decide which contributions to publish. Other benefits can be found at The Reporter and Media Library, as well as elsewhere throughout this site.